Flutist Alicia "Lish" Lindsey was born in South Korea and grew up in New Jersey, 15 minutes outside of Philadelphia, PA where jimmies and sprinkles are considered two different confectionery toppings. She currently resides in the heart of New York City's Theater District. 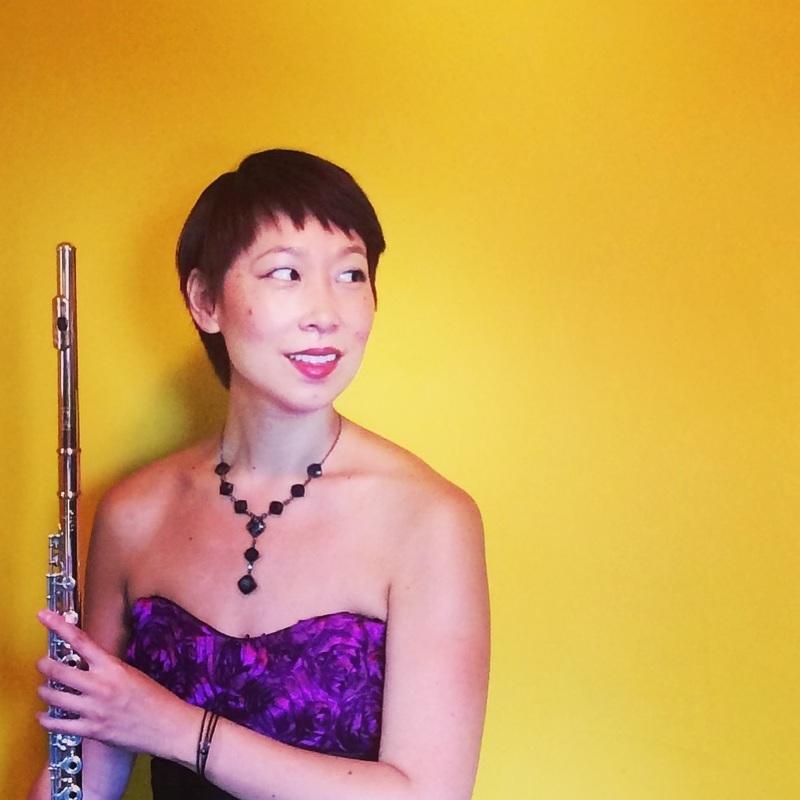 As a freelance musician she has enjoyed performing with some of the most engaging and vibrant musicians in the United States as well as in Japan, China, Italy, England, and Wales. Lish can be found performing with the Capital Philharmonic Orchestra (principal piccolo), Eastern Wind Symphony (principal flute, former principal piccolo), Sinfonietta Nova (principal piccolo), Fresh Squeezed Opera Company (core company resident flutist), One World Symphony (alto/bass flute), Rittenhouse Orchestra, the Latin-American Flute Quintet and Ensemble (bass flute, contrabass flute), and Badger.Mantis, a flute/clarinet duo with her husband, Broadway woodwind musician, Todd Groves. Lish is a ryūteki (Dragon Flute) player performing medieval Japanese court music with The Gagaku Ensemble of New York and Tenri Gagaku Society. She enthusiastically enjoyed her time as a substitute flutist for the Broadway musical, Finding Neverland (starring Matthew Morrison, Alfie Boe, Tony Yazbeck, Laura Michelle Kelly, Kelsey Grammer, Kevin Kern, Paul Slade Smith) in NYC. Pop orchestra tours include Josh Groban (with Sarah McLachlan, Foy Vance, Lena Hall), soprano Sarah Brightman (with Vincent Niclo and Narcis Iustin Ianău), Il Divo , Hanson, Il Volo (Gianluca Ginoble, Piero Barone, Ignazio Boschetto), Rocktopia Live (with Rob Evans, Tony Vincent, Chloe Lowery, Mairead Nesbitt), Evanesence, Celtic Thunder (Neil Byrne, Emmet Cahill, Ryan Kelly, Damian McGinty), violinist Lindsey Stirling, Strauss Symphony of America, Jerry Garcia Symphonic Celebration with Warren Haynes, and Video Games Live. Current adjunct applied and lecture teaching appointments include Wilkes University, New Jersey City University, CUNY Brooklyn College, Montclair State University, and Mercer County Community College. Lish returns for her fourth season teaching in Sarteano, Italy (Tuscany) with Summer Music in Tuscany (applications close 4/15/19) and for her sixth season as a clinician at the Pocono Flute Camp in East Stroudsburg, PA in late July 2019. Lish is a member of AFM Local 802 (NYC), 77 (Philadelphia), 62 (Trenton), the National Flute Association, the New Jersey Flute Society, the Pocono Flute Society, the Flute Society of Greater Philadelphia, the Flute Society of Washington , and has held membership with New York Flute Club and Opera America. She recently accepted the Public Relations Coordinator position with the National Flute Association starting in Fall 2018, is a board member with the Fresh Squeezed Opera Company (NYC) and Carter-Glennon Arts (NJ), the chamber recital coordinator for Sinfonietta Nova, was the orchestra manager for New York Opera Exchange (NYC), and was on the Board of Directors for Litha Symphony Orchestra (NYC). ​Lish was a recorded round judge for the National Flute Association's High School Soloist Competition, San Diego Flute Guild Young Artist Competition, Flute Society of Greater Philadelphia's Young Artist Competition (twice), and was a live round judge for the New Jersey Flute Society's Concerto Competition, Pocono Flute Society's Young Artist Competition, Flute Society of Greater Philadelphia's Young Artist Competition and Tomasone Youth Artist Competition. Current Equipment: 14k Handmade Powell Flute with a Martin Gordon Headjoint, Kowalewsky Grenadilla Palanca Traverso, Grenadilla Haynes Piccolo, Silver Rudall Carte Alto, Artley Ogilvie Bass, Di Zhao Contrabass, and various ethnic flutes and whistles.